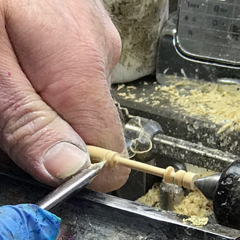 I am a full time professional bobbin maker, living in Coleford on the Mendip hills, about 10 miles from the beautiful city of Bath, England. 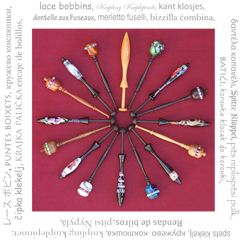 I started making and selling bobbins in the mid 1980's, when I turned wood as a hobby, and attended local craft fairs. It was not long before local Lacemakers from Wessex Lacemakers and Clevedon Lacemakers took me under their wing and gave me some constructive criticism re the bobbins that I was producing at that time I owe special thanks to Mrs Reed from Bristol Lacemakers. I took their advice, developed my own style and have never looked back. 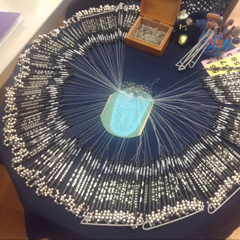 Invitations to lace events soon followed, and I was producing more and more bobbins. In 1986 I won a Gold medal at the "Woodworker" show for a display of my Lace bobbins . I am one of only two bobbin makers/suppliers in the UK that have a license from Copyrights to hand paint some of the characters from Beatrix Potter (Copyright Frederick Warne and co 1991). If you have any questions or problems when using my shop then please contact me using the contact me form at the bottom of each page.